Are you a writer wanting to expand your portfolio? Maybe a dog lover who also loves to write? A breeder who'd like to get more exposure to their website? Do you have some knowledge or skills in a particular area that you would like to share with our readers? This site is all about small dogs – breed profiles, grooming, training, health care, day-to-day living, as well as activities you can do with your small dog. We will give you up to two links back to your blog, website, or social media platform in your Author bio. These links will be "do follow" unless you are linking to a product page in which case they will be "no follow." When you write for us, all submissions must be original and cannot be published anywhere else. We look for well-written articles that are useful or entertain our visitors. All must be related to small dog ownership. We will edit all submissions for content, clarity, spelling and grammar. The readers of this site come from the U.S. and Canada, the U.K., Australia and New Zealand mainly but other countries are also represented to a smaller degree. If you are a non-native speaker of English, please have a native speaker edit your work before you submit. Most of the articles submitted are published with little to no change. We may change things here and there to improve SEO. If I need to make substantial changes, we will send you the final version, for your approval. Usually that doesn't happen. If I find that the material is inappropriate or requires too much editing, I may reject it at first. If this is the case, you may rewrite it and submit again for consideration. Articles should be between 1500 and 2000 words and should include at least a couple of subsections and links if appropriate to outside sources. You are welcome to add personal antidotes if they will enhance your article. You can provide me with photos or I can find appropriate graphics to complete your article. Please identify photo sources with a link back to the source. If photos are your originals, please indicate that as well. 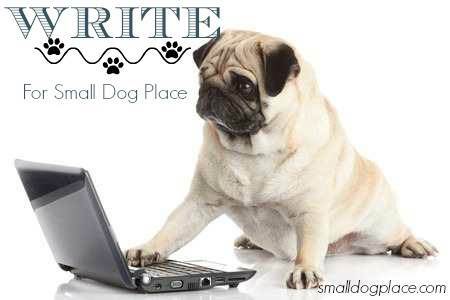 Please remember that we only publish articles relevant to small dogs. If you choose to do a profile for a breed that has not been done previously, you can download our breed template and fill in the information based on your own knowledge. All small dog breeds are listed on Small Dog Breed List. You can also provide a small head shot if you like. This is an excellent way to enjoy the free promotion, so we’d love to hear from you. No articles that have been published elsewhere. We do a plagiarism check before the article goes live, and periodically thereafter. Should we find that the article has been published elsewhere, we will immediately remove your article and your link and ban further requests. The article was published elsewhere or there is substantial plagiarism within the article. The article is poorly written. This includes a sizable number of technical errors such as grammar or spelling or it could be due to weak content that adds little. An example of this might be: "The Shih Tzu is a small dog. It is a toy breed. It can be registered with the AKC...and so forth." I know this sounds crazy, but I have received articles very similar to this. The link you are requesting points to a page on your site this basically a sales page containing numerous affiliate links. Your website is either brand new, does not rank well, or your sole purpose in publishing an article is to improve and increase your backlinks. Please fill out the form below and we will contact you shortly. Please give me several suggestions for topics. If you don't have any in mind, just ask and I can give you some ideas to ponder.